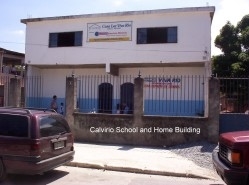 Calvirio Boy' Home is run by Pastor Reinaldo Junior and his wife Bruna and Leila is the supervisor. The Home has been functioning since the 1990's and has seen many boys from precarious situations come through it's doors. The mission first started out with the vision of Pastor Junior's father taking the gospel message to the streets, with practical as well as spiritual help. They opened a soup kitchen every Friday on the Rio de Janeiro beaches and ministered to many of the homeless children there. Very soon they realized that a once-a week visit was not enough and gradually a little two roomed area was built on top of the old church building to house any who would like to stay. Latin American Ministries came into contact with them then and from there the church moved into rented accomodation and a whole new building was built on the top, with the bottom half being turned into a school for the poorest children in the neighbourhood. LAM has now been partnering with them for some 12 years and boys we have known, rescued from the streets and dangerous family situations, are now going on to college or working in responsible jobs. At the moment there are 17 boys in the Home. It's full capacity is 25. The school now includes a creche and takes babies and toddlers, to care for many little ones who were left to their own resources. LAM supports the Boy's Home on a regular monthly basis, thanks to our partners help.